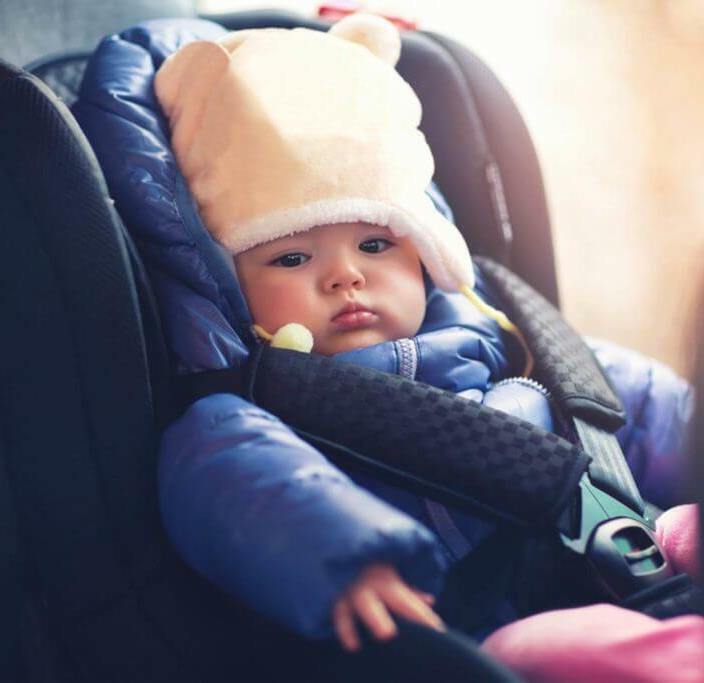 →Why do puffy winter coats compromise car seat safety? As winter sets in the coming days, it’s time to start taking those puffy coats, boots and other garments out of bins and closets. When it comes to your kids, the wool or fiber does a great job protecting them from the frosty weather when they are at home, school and social places. And you will love it when they are completely insulated. The thick puffy coats are a threat to your child’s safety when travelling in a car seat. You are most likely oblivious of this fact. Did you know that there are crash tested coats that your child can wear while travelling in a car seat? Check out our list of best winter coats for baby car seats. When your kid is in a puffy jacket and you put him or her into the car seat, strapping the seat belt gives a misleading sense of tautness. Air puffs out of the jacket but that does not guarantee that the seat belt is as tight as it should be. Or at least as it would without the coat on. Child injury specialists have done tests involving strapping a child in a winter coat as tight as possible and then strapping the child again to the same latch position but this time without the winter coat. The slack generated in the second time is in most cases enough to force an adult hand through! Did you know that according to the Automobile Assurance Society of Quebec, at a 50km/h car crash, the weight of objects and people in the car is multiplied by 20 at that moment of impact? This means your 9-kg child becomes a 180-kg projectile. Miriam has conducted a car crash simulation to prove the dangers of wearing puffy winter coats in car seats. She uses a child-equivalent dummy in a winter coat and at only 30mph impact, it comes hurtling out of the jacket and the straps. In case of a crash, the slack could provide room enough for the child to shift. The straps might trap the jacket but your child gets ejected out of his jacket and the car seat. The after effects of this could be head injuries, concussions or even death. The shifting in the straps might also cause your child injuries such as cuts and fractures. To ensure that your child is collision safe in his or her car seat, you need to take out the puffy jacket and fasten the harness without it. By now you are probably wondering what sense it makes to sacrifice warmth for safety. 1. Warming up your car-Warm up the car before the journey. There will be no biting cold inside to necessitate a bulky jacket. 2. Use of thin layered clothes– Dress your child in thin layers so that the seat belt can be as tight as possible. The outer layer should preferably have a synthetic element in order to trap some insulating air while still being able to breathe. -Hooded in order to trap your kid’s body heat from the head and the neck area. Thermal pajamas– Good thermal pajamas are soft, lightweight and incredibly comfortable and you can have your child wear them under his or her normal clothing. 3. Cozy toe or foot muffs-For infants and toddlers after fastening the harness around him or her, zip him or her in a child car seat manufacturer approved cozy toe or footmuff. 4. Use of a thin a blanket– if the foot muffs or cozy toe are not available, find a thin blanket, fold it in half and tightly tuck it around the baby and over the strapped harness. A word of caution is that the blanket should not cover your child beyond the armpit level. The same blanket covering process can be used with older children. Not covering beyond the armpit level allows the child or you to easily take off the blanket if the car interior gets too hot, which wouldn’t have been possible if the child was wearing the winter coat. 5. Hat and gloves– Finally, ensure that you cover the child’s head with a hat, gloves on his her or her hands, as this helps to trap his or her body heat. Contrary to popular opinion, do not place your child’s coat backward over him or her to act as a blanket. The reason is that the child will definitely be tempted to slip his or her arms through the jacket sleeves, and this can complicate his or her removal from the car seat in case of an emergency. Alternative to the above solutions, there are some child winter coats that are thin enough not to affect the seat strap tautness. These include crash tested road coats and fleece jackets . They are amazingly warm, comfy and specially designed for use with child car seats.